Following the launch of the first generation of analogue mobile networks and phones, Europe had become a collection of countries in which each had adopted their own but incompatible cellular systems. The UK and Ireland had TACS/ETACS, the Scandinavian countries and the Netherlands had adopted the Nordic Mobile Telephone (NMT) system, Germany used C-Netz, the Radiocom 2000 service was in use in France and Italy opted for RTMI. For a mobile phone user in the UK all of this meant that their phone would stop working when they reached the English Channel! However, three years before the UK launched its first analogue mobile, in the interests of developing a true single market, the European Commission embarked on a programme of work that would seek to develop a mobile phone standard that could harmonize public mobile communication systems in the 900MHz band throughout Europe. A working group called Groupe Speciale Mobile (GSM) was established by the Conference of Postal and Telecommunications Administrations (CEPT) to realise this vision. 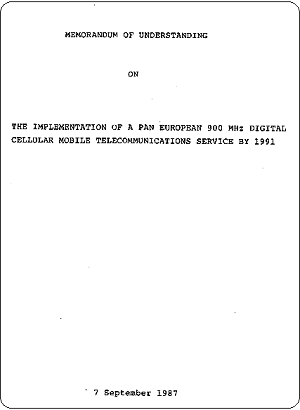 It first met in Stockholm in December 1982 and the culmination of its work was the publication on 7th September 1987 of a Memorandum of Understanding on the Implementation of a Pan-European 900MHz Digital Cellular Mobile Telecommunications Service by 1991. Signed by telecommunication operators from thirteen countries in Copenhagen, this memorandum of understanding would later be described by Chris Gent, the then Managing Director of Vodafone, as the most important document in the history of the mobile phone. The UK played an important role in its development for it was written by Stephen Temple, a senior figure within the Department of Trade and Industry, and who represented the UK’s interests within the GSM work group. You can read more about this critically important, but often behind the scenes, phase in the history of the mobile phone, in Stephen Temple’s book, “Inside the Mobile Revolution, A POLITICAL HISTORY of GSM” which is available to download from his website. The onward development of GSM was transferred from CEPT to the newly created European Telecommunications Standards Institute (ETSI) and whilst there was no pre-conceived intention, it was ultimately agreed that GSM would be based on digital technology using a process of both frequency and time division multiplexing. With this approach, the available frequency band for GSM is firstly divided into a series of radio channels, each of which has a bandwidth (low to high frequency difference) of 200kHz. This is the frequency division element and sets of frequencies are allocated to the mobile phone network to ensure that adjacent cells use different frequencies. Transmission within these frequency channels is then shared across several devices using time division multiplexing. Here, within a given radio channel devices are allowed to transmit, but only one at a time, and for a strictly controlled period of time, before the next device is able to transmit and so on. 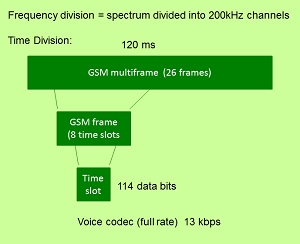 The basic time unit within GSM is known as the burst which is equal to 0.577ms. This time comprises a block of 148 bits that are transmitted at a data rate of 271kbps and a guard band. A sequence of eight consecutive bursts form a GSM frame and 26 consecutive frames constitute a GSM multi-frame. This means that a multi-frame is equivalent to a time period of 120ms and contains 208 bursts. However, of the 26 frames that constitute a multi-frame, two are used for network control purposes and are not therefore available for carrying mobile phone calls or data. Equally, within each burst, only 114 bits are allocated for calls and data. So, if a particular mobile phone was allocated a burst within each available GSM frame, this would equate to an available data rate of 22.8kbps. Within the mobile phone a codec (coder/decoder) is then used to convert the human voice from analogue into digital form for transmission. By implication, implementing a new pan-European digital network meant that existing analogue mobile phone networks would eventually be turned off with their frequencies being re-allocated for GSM services. The UK Government, in response to EU Directive 87/372/EEC, had previously announced that the upper 10MHz of the mobile phone bands (905-915MHz and 950-960MHz) would be reserved for GSM and not be released for further expansion of the first generation analogue TACs networks. Needless to say that with the UK's two mobile phone operators (Vodafone and Cellnet) rolling out their TACs networks, this decision was controversial and ultimately, additional frequencies below 905MHz and 950Mz would be released from military use to ease mobile phone congestion especially in the London area. The world's first GSM telephone call was made by the Finnish Prime Minister Harri Holkeri on the Radiolinja mobile network in Finland using a Nokia 6050 car phone on 1st July 1991. Within the UK, Vodafone was the first operator to launch a GSM service when their network went live on 2nd December 1991 despite the obvious lack of handsets. Interestingly, it wasn't until July 1992 that Oftel (now Ofcom) formalised the GSM licences awarded to both Vodafone and Cellnet. The first mobile handset to be approved for use on GSM networks was developed by Orbitel Mobile Communications, a Basingstoke based company formed in 1987 as a joint venture between Plessey Corporation and Racal Telecommunications, and launched in May 1992 as the Orbitel 901. Whilst the Orbitel 901 was actually a transportable, Motorola launched the world’s first GSM handportable mobile, the Motorola International 3200 on 3rd September 1991. Resembling one of the earlier analogue phones from Motorola’s 8000 range, the 3200 actually became the UK’s most popular GSM mobile. Nokia’s first GSM handportable was the Nokia 1011, so called because it was launched on the 10th November 1992. Also known as the Nokia Mobira Cityman 2000 the launch of the Nokia 1011 helped propel Nokia to becoming the world’s largest mobile manufacturer. In developing GSM the way in which a mobile phone is identified on the network also changed. Whereas with first generation analogue mobiles the telephone number was hard wired into the phone itself, with GSM this information was contained in a removable Subscriber Identity Module or SIM card. This allowed manufacturers to mass produce phones which could then be configured for a particular operator in a given country by inserting the correct SIM. Initially these were credit card sized (85.60 x 53.98 x 0.76 mm) but as the GSM mobile was developed and made smaller, a miniature version (25 x 15 x 0.76mm) became standard. In addition to recording a subscriber’s International Mobile Subscriber Identity (IMSI) and the network to which it is registered, a SIM card can also store other information such as personal phone book entries. Creating a single, standard, mobile phone network within Europe through the development of GSM enabled manufacturers to truly exploit the resulting economies of scale and push their sales to new heights with several new entrants moving into the mobile market. The UK Government was keen to encourage further competition within the mobile market and to expand capacity. However, whilst demand existed to accommodate more mobile phone operators, there was insufficient radio spectrum to accommodate them. Therefore, an additional frequency band at 1800MHz (1710-1785MHz from the mobile and 1805-1880MHz from the base station) was made available for GSM. 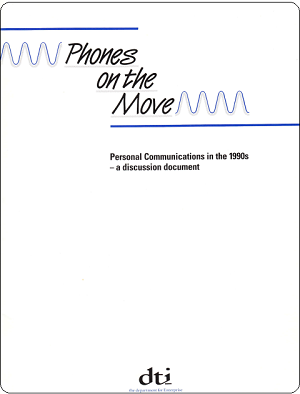 Termed Personal Communication Networks (PCN) these new networks were announced by Lord Young, Secretary of State for Trade and Industry in January 1989 in a document entitled, “Phones on the Move”. Provision was made for three licences to operate these new networks, with one being offered to Cable and Wireless who operated Mercury Communications whilst a second and third would be opened up to bidders. This competition was subsequently won by Unitel which was owned by a consortium including US West and Microtel that was owned by a consortium that included British Aerospace. However, in 1992 Cable and Wireless and US West merged to form Mercury Personal Communications through which they launched Mercury one2one and British Aerospace sold Microtel to Hong Kong based Hutchison Telecom. The Mercury one2one network became the world’s first 1800MHz GSM network when it was launched on 7th September 1993 and the UK’s second GSM network. Initially the service was restricted to the London area but offered a unique proposition to customers and that was free calls during the weekday evenings (7pm - 7am) and throughout the weekends. The UK’s third GSM network to launch was that from Cellnet which opened in December 1993 and this was followed by the fourth, launched by Hutchison Telecom on 28th April 1994; the second of the two new entrants at 1800MHz. Hutchison’s approach was to focus on providing national coverage with products targeted at the general consumer. They named their network Orange and launched it with the catchy slogan, “The future’s bright, the future’s Orange”. Uniquely at that time, per second billing, caller-ID and Talk Plans with inclusive minutes were offered as standard. The total number of UK GSM (2G) mobile operators therefore grew to four – Vodafone, one2one, Cellnet and Orange, with Vodafone and Cellnet also continuing to operate their 1G analogue ETACS networks. The transition from first generation analogue to second generation digital networks also saw the mobile phone move from being the preserve of the business, commercial user to become a must have device for the domestic, general user. Mobile phones would soon be seen as an essential part of modern living and for the UK, 1999 was a tipping point when a new mobile phone was being sold at the rate of one every four seconds and ownership doubled to 46% of the population and then reached 73% the year after. This massive expansion of the market brought new challenges for the mobile manufacturers who had to find ways of encouraging people to not only buy their first device but their second, third, and fourth. Companies therefore started to develop and market the mobile phone as a device that combined the convenience of being able to keep in touch on the move with a fashion item and entertainment centre. Amongst these, Nokia was one that truly embraced and exploited the mobile as a device that could be personalised and most importantly be specifically targeted at the younger customer. Released in 1994, the Nokia 2110 became the first to use the now famous, indeed iconic, Nokia ringtone based on a guitar work named Gran Vals by Spanish musician Francisco Tárrega written in 1902. Offering consumers a range of ringtones became common place including the ability to compose your own using tones selected from the keypad. A whole new industry, devoted to authoring and selling ringtones emerged as a result. The Nokia 5510 launched in 2001 was most definitely first and foremost an entertainment device and a phone second. Advertised as looking weird but sounding great, the 5510 could store up to 2 hours of music and included a FM radio. The Nokia 5110 allowed people to change the phone's covers to reflect their mood or style with the marketing claiming that you could now match your Nokia mobile phone with almost any clothing, style and occasion. Initially a simple colour range was available but the concept soon grew to become a standard feature of mobiles with a major business emerging to support the production of an enormous range of general, special and limited edition covers. With the younger customer firmly in their sights, Nokia launched the 3210 in 1999 which became one of the most popular and successful mobiles ever produced with over 160 million being sold and went on to spawn a dynasty of iconic Nokia phones comprising the Nokia 3310 which sold 126 million and the Nokia 3410. The Nokia 6110 was the first to feature the cult mobile game, Snake. This obsessive game required you to control a pixelated snake as it moved around the screen, feeding it to make it grow bigger but all the time ensuring that it never caught its own tail! This game proved incredibly popular, being loaded onto millions of mobiles and it has even been successes that it kick-started the whole mobile gaming business which continues to thrive to this day. Advances in mobile phone design were accompanied by new methods of charging for their use. In August 1997 Mercury one2one became the first UK mobile phone operator to offer a pay as you go service. Instead of costly and long term contracts, users could buy they phone and then simply buy an airtime card that contained a fixed amount of call credit, typical £10, £20 or £50. Price plans included the standard pay as you go in which calls started at 30p per minute but decreased to 5p per minute after you had made more than two minutes of calls in a day. Anytime daily plans required you to pay a small daily charge, 50p to 83p and for this your call rates dropped to between 2p and 10p depending on the time of day and you received a fixed number of free call minutes per day. Needless to say all of the other mobile phone operators followed suite with their equivalent service for example, Vodafone’s Pay as you Talk. A digital mobile phone system had an added advantage over the previous analogue generation and that was a natural in-built capability to handle non-voice services. One of these new digital services was the Short Message Service (SMS) that allowed 160 character (7 bit) messages to be transmitted over the mobile phone signalling channel. Originally intended as a service which operators could exploit to keep customers informed about important changes to their service, SMS took everyone by surprise and became a mass market communication method in its own right. Given its intended purpose, the first generation of 2G handsets could only receive, not send SMS text messages. In addition to being the first handset licensed for use on 2G networks, the Orbitel 901 has another claim to fame and that is that it was the mobile on which the world’s first text message was received. On the 3rd December 1992 Neil Papworth used his computer to compose and send a SMS text message to his Vodafone colleague, Richard Jarvis who received it on his Orbitel 901. It simply read, “Merry Christmas”. However, mobiles hadn’t been designed with text messaging in mind and so new ways had to be developed to make it easier to compose and send messages. This led to the development of predictive text where letters of the alphabet could be typed by pressing the numeric keys several times with software then trying to automatically complete the word you were typing. Text on 9 keys or T9 predictive text was developed by Tegic Communications and first used by Nokia on their 3210 mobile in 1999. Motorola developed an alternative called iTAP which was also first used in 1999 on their L7089 and Blackberry introduced SureType in 2004 onto their 7100 range of mobiles which, unusually for Blackberry, did not have a traditional QWERTY keypad. Companies, such as Motorola, even produced devices like the v100 that were designed specifically for texting, so much so, that it didn’t have an in-built speaker, requiring you to use a headset when making phone calls. With the mobile becoming a mass market consumer item and ownership exceeding half of the population, it was now that text messaging truly took off. In 2000, 6.2 billion text messages were being sent each year over the UK GSM networks. Large though this figure was, text message usage would continue to grow rapidly until it reached a staggering 155 billion before beginning to fall as a result of users switching to social media applications. However, in the process text messaging redefined our language introduced abbreviations such LOL and OMG into common usage. The mid to late 1990s was the time during which the World Wide Web began to emerge which in turn had an important impact on the development of the mobile phone. In June 1997 the Wireless Application Protocol (WAP) Forum was formed by Ericsson, Motorola, Nokia and Openware with the aim of producing a common standard for providing internet access to mobile phones. Providing access to the World Wide Web on a mobile phone is a non-trivial problem for, unlike a PC, the mobile has a small screen size, has limited processing power, restricted graphics, does not use the Internet Protocol (IP) and has a numeric keypad input. In April 1998, WAP 1.0 was released and the Nokia 7110 became the world’s first mobile phone to feature a WAP enable browser. Access to the Internet required you first to connect to a data bearer service which typically, included either an SMS message or circuit switched data service. Thereafter you could only read websites that were coded in wml rather than html; hence, organisations needed to maintain multiple versions of their websites. The development of WAP continued with version 1.1 being released in 1999 and version 1.2.1 in 2000. Unfortunately, WAP did suffer from an excess of media hype about its capabilities and visions of a fully featured web experience in your pocket were soon replaced with the harsh reality of what was truly possible with a 1990s vintage mobile! Connecting a mobile to the web was further illustration of how the humble mobile phone was taking on more and more features associated with a computer. IBM is credited with making the first step in that direction when they jointly announced with telecommunications provider BellSouth, the Simon Personal Communicator Phone on 8th November 1993. That device combined the features of a PDA with that of a mobile phone thereby offering users email, a calculator, calendar, clock, phone, address book and notepad, all accessible through a stylus activated touch screen. In Europe, Nokia announced the Nokia 9000 Communicator in 1996 as the world’s first all-in-one mobile communications tool. In addition to all of the basic phone, address book and SMS functions, the Nokia 9000 had a document handling and editing feature called Notes, a fully featured calendar and diary application, a clock showing world time and including an alarm and connection to a PC via an Infra-red port through which documents could be exchanged and software downloaded and installed. However, the most important feature was connection to the Internet using Nokia's Smart Messaging for access to email, remote computing and elementary information services. With mobile phones starting to morph into computers, the industry was seeking a new name to give to these more powerful and capable devices and it was Ericsson who came up with the answer. The Ericsson R380 World, launched in 2000 was the first to be officially marketed as a “smartphone”. It was also the first mobile to use the EPOC32 operating system which was originally used in Psion PDA organisers but then onward developed to become the Symbian Operating System. The R380 adopted a flip design in which a conventional phone keypad partially obscured a large touch screen. When open, the whole of this screen could then be used for smartphone applications with text entry either being done using a QWERTY keyboard displayed on the touch sensitive screen or by a handwriting recognition application. Originally conceived as a means of unifying mobile services within Europe, GSM has gone on to become a world beating technology. However, whilst in the UK GSM services are provided on both 900MHz and 1800MHz, the USA offers services at 1900MHz. Bridging this gap between Europe and the USA was therefore hugely important for establishing GSM as a universal standard. The Motorola mr601 launched in 1997 offered dual band coverage at 900MHz and 1800MHz thereby enabling it to be used on any of the UK’s four networks. However, the Bosch World 718 was the first mobile to offer international coverage when it was launched in 1998 supporting both 900MHz and 1900MHz. This meant that either a Vodafone or Cellnet customer could use the same device in the UK and USA. However, it was the Motorola Timeport L7089 released in 2000 that provided tri-band coverage on all three frequencies and hence, on all UK and USA GSM networks. With ownership of digital, GSM mobiles soaring and the capabilities of the handsets growing year on year, it was clear that the analogue (1G) networks would need to be closed down. On the 1st October 2000 Cellnet closed their analogue ETACS network and Vodafone closed theirs on 31st May 2001 at which point the UK became a fully digital mobile country and with that so ended the 16-year era of analogue mobiles. Moving to GSM had however, dramatically redefined the marketplace with the mobile becoming a common every day object, affordable to millions and beginning to be differentiated by its non-voice features. Manufacturers were able to exploit the huge global market which GSM created and the world’s top selling mobile of all time is the Nokia 1100 which was launched on 27th August 2003 and achieved sales of 250 million world-wide. However, with the dawning of the new millennium, the onward development of the mobile phone would be firmly driven by a desire to increase and expand its non-voice capability and specifically, to fully integrated it with the Internet and for that, higher speed data access was needed. The original GSM network was effectively a traditional telephony network with mobile radio access that supported basic data services much the same as the home telephone line supported dial-up connection to the Internet prior to broadband. The evolution of GSM would therefore see the introduction of the General Packet Radio Service (GPRS) and the concept of an always on Internet connection. Explore our collection of GSM mobile handsets which is arranged here by the year in which each model was released. Further details about each mobile can be seen by clicking the make and model number. Alternatively, you can click one of these links to view the complete collection in full detail ordered either by the year in which each mobile was released or by the mobile manufacturer.